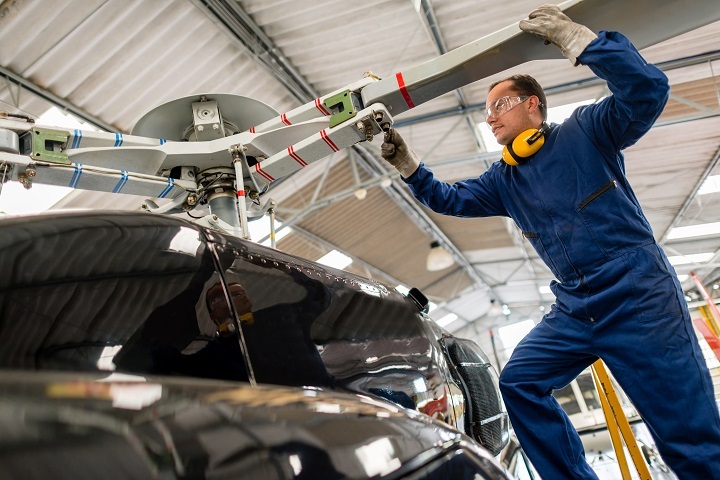 The Aviation Maintenance Technician-Helicopter (AMTH) program gives the student a foundation in the basics of flight and general aviation maintenance. Building on this foundation, the program then focuses on specific aspects of helicopter maintenance. The course of study takes the student through the hands-on techniques and knowledge in such areas as composite fabrication and repair, sheet metal, hydraulics, pneumatics, instrumentation, landing gear, piston and turbine engines, and other aircraft systems. The student learns the intricacies of the entire aircraft as each system is dissected for deeper understanding. The students will gain the skills to properly and efficiently troubleshoot and repair both fixed-wing and rotary aircraft. After obtaining a foundation in aircraft maintenance, the student will be given in-depth instruction on the specific concepts, procedures, and techniques that apply to rotary aircraft. The student will study the unique theory, operation, and maintenance of helicopters, covering in detail rigging, weight and balance, the extra care needed for loading the helicopter, transmissions, rotor heads, rotor blades, turbines, and their static and dynamic balancing. They will also study how electrical systems, avionics instrumentation, and autopilot differ for helicopters. The Aviation Maintenance Technician—Helicopter graduate will receive training in the knowledge and skills required to pass the Airframe and Powerplant certification test administered by the Federal Aviation Administration (FAA) to gain entry-level employment in exciting careers as an A&P Mechanic, Aviation Maintenance Technician, Avionics Technician, Inspectors, Installers, Parts Managers, or Service Technicians. The graduate will find these career opportunities throughout the U.S. and the world in the areas of aircraft manufacturing; charter, corporate, or commercial airlines; the U.S. Government; or in the ever-growing general aviation sector. Positions with the regional and major airlines often include good wages, comprehensive benefits for the graduate and family, and complimentary free travel. The unique helicopter training will make the graduate even more competitive for positions with helicopter operators. *Program details may vary by campus.